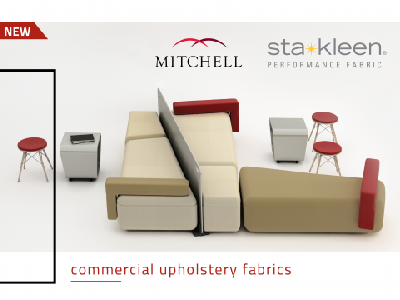 Innova announces the launch of Sta-Kleen Performance Fabric by The Mitchell Group in Australia. Exclusively distributed by Innova International, Mitchell’s range of faux leather upholstery fabrics includes Highwood, Crisscross and Congo, the first truly cleanable faux leathers with a tactile feel quite like real leather. Combining aesthetic appeal with performance, maintenance and environmental qualities for both commercial and contract upholstery, Sta-Kleen faux leather is specifically suited for high traffic areas such as in commercial interiors, hotels, restaurants and clubs as well as education, healthcare and aged care facilities. The enhanced durability provides sufficient resilience to these fabrics to withstand the rigours of commercial cleaning, especially in healthcare and other commercial environments. The Mitchell Group is committed to developing products with reduced environmental impact. For instance, materials used in the Sta-Kleen manufacturing process are free of phthalate, formaldehyde and PVC. Sta-Kleen Performance Fabric (in selected colours) meets the goals set forth by the Healthier Hospitals (HH) Safer Chemicals Challenge, Version 2. The Sta-Kleen faux leather collection will initially be offered in three patterns: Highwood, a subtle two-tone leather look in 9 colours; Crisscross, a shimmery linen look in 7 colours; and Congo, an animal hide inspired design in 5 colours. Contact Innova to know more about additional patterns and colours.